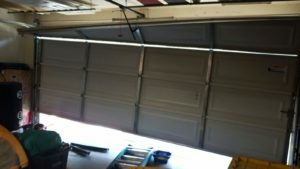 Whether your garage door is manual or automatic, one of the most frustrating malfunctions that can occur is when it slips off its tracks. This can lead to the door jamming, sticking, closing crookedly, or even damaging the door itself. There are a number of reasons that can cause a door to slip off its tracks, but no matter what the cause, trying to fix it on your own can be costly and dangerous. You may subject the door or the tracks to further damage or severely injure yourself, especially if you are inexperienced with repairs like this. Instead, call us here at Perfect Solutions Garage Door. Not only will we discover the cause of the problem, but we can fix your door quickly, and since we have 24-hour service, we can come day or night. Your garage door may have slipped its tracks for a number of reasons. The door may be unbalanced, which can lead to one side being heavier than the other and cause the slippage. If you or a family member tried to operate the automatic door with the lock engaged, it may have caused a jam, which caused the door to slip off the tracks. Obstacles that the safety sensors cannot properly detect or trying to back a vehicle out of the garage before the door is fully open can cause the door to close and open much too quickly, forcing the door to come off the tracks. Old or inferior springs may also be the culprit; they can cause the cables that operate the door and cause it to close and open to lose their tension. When the door is closed or opened, the cables can malfunction and cause the door to come off track. Not all of these problems are preventable, but no matter what the cause, we can fix them all. When your door goes off track, it can often cause it to stick halfway, leaving you with no way to put your car away or leaving valuables in the garage vulnerable, such as gardening and landscaping machines or other vehicles. If this happens late at night or early in the morning, the problem can be even more of an inconvenience. Our Perfect Solutions services will be available to fix any garage door 24 hours a day. Call our emergency services and one of our seasoned professionals will be right there to help in under 30 minutes. You will never have to worry about waiting to get your garage door—and your life—back on track.